Dimensions 19W x 15.25H x 5.5D in. 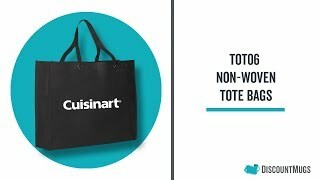 Are you in the market for eco-friendly logo non-woven tote bags? Then you have arrived at the right place. With long lasting reusable materials our custom printed shopping bags can be personalized with your brand name, company logo and special message. Order our cheap grocery tote bags in any color of your choice and add a custom design using our easy online design tools. Save with our discount prices and present your clients and employees with promotional items that they’ll truly enjoy. Upload your artwork to our site at the time you complete your order and avoid further delays on your order of custom wholesale logo bags. We use these reusable bags for our customers at checkout and they are always a great hit. We love how our bags are a walking advertisement for us. GREAT quality item and printing. Will order again! Thank you! Worked very well for my business. I love this product and I would like to reorder, but, my signature color is ORANGE and you no longer show that color. PLEASE let me know when it is back in stock.